DALLAS – Sept. 25, 2018 – Genetic testing can play a substantial role in medical management by uncovering changes in genes that are associated with an increased risk for hereditary cancers. A new research study from investigators at UT Southwestern Medical Center strongly encourages testing laboratories to periodically review their records and alert physicians when scientific knowledge evolves and genes are reclassified. That conclusion is based on a study that reviewed genetic testing results from 1.45 million individuals and found that nearly 25 percent of "variants of uncertain significance" were subsequently reclassified – sometimes as less likely to be associated with cancer, sometimes as more likely. The study appears in the Journal of the American Medical Association (JAMA). When variations from the norm are discovered in a gene, the variants are classified as "benign," "likely benign," "variant of uncertain significance," "likely pathogenic," or "pathogenic." "If a variant is reclassified to being pathogenic, then it matters to the patient," said Dr. Theo Ross, Professor of Internal Medicine and senior author of the study. "For example, if they have a broken Lynch syndrome gene, then they need different care from their doctor such as having colonoscopies at an earlier age or more frequently – sometimes as often as every year. Or, if they have a broken BRCA gene, they may want to have prophylactic surgery or add MRI scans to their mammogram screening program." Even a reclassification from "variant of uncertain significance" to "benign" can be important to a patient, providing them with peace of mind. The typical gene contains about 27,000 base pairs (A-T, G-C), though some genes contain as many as 2 million. "Bases are the letters used to spell our DNA, as well as sequences that regulate our genes," said Dr. Ross, who is a member of the Harold C. Simmons Comprehensive Cancer Center at UT Southwestern. The large number of base pairs in each gene means there are myriad potential variations and there are many gaps in knowledge about the significance of individual variations. But knowledge about gene variants is constantly growing and evolving. "We are getting new data all the time. We may identify new families that have an inherited susceptibility to cancer and learn something from their DNA. Labs may determine the atomic structure of the protein product of the gene with the variation and see an abnormal shape or find that cells with the variant gene don't behave as expected. With collective familial, biochemical, and functional data all pointing to abnormal, a variant is reclassified from "variant of uncertain significance" to "pathogenic," said Dr. Ross, who holds the Jeanne Ann Plitt Professorship in Breast Cancer Research and the H. Ben and Isabelle T. Decherd Chair in Internal Medicine in Honor of Henry M. Winans, Sr., M.D. The research study published in JAMA reviewed test results for hereditary cancer genes from a single laboratory, Myriad Genetics, over a 10-year period, as well as associated clinical data from UT Southwestern's Cancer Genetics Program. Of the 1.67 million initial reports, 60,000 amended reports were issued. Overall 24.9 percent of classifications as "variant of uncertain significance" were reclassified, with the majority of those reclassifications being downgraded to benign. "The implications of this study are three-pronged. Physicians need to be aware of how rapidly knowledge about gene variants is advancing and that reclassifications are common. Labs need to review gene variant information on a regular basis and alert physicians to changes. Finally, patients and their family members need to be made aware of reclassifications by their physicians so they can make well-informed choices," Dr. Ross said. 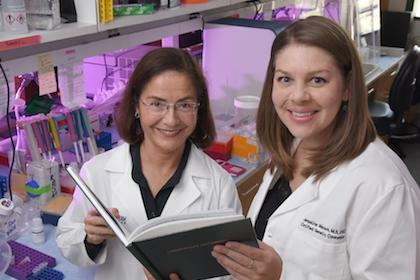 Other UT Southwestern authors include first author Jacqueline Mersch; Nichole Brown, formerly of UT Southwestern; and Sara Pirzadeh-Miller, all genetic counselors in the Cancer Genetics Program at UT Southwestern, which is recognizing its 75th year as a medical center in 2018. This work was supported by the National Institutes of Health, the Lucy and Henry Billingsley Fund, and a Burroughs Welcome Fund Clinical Scientist Award in Translational Research. The Harold C. Simmons Comprehensive Cancer Center, one of 49 NCI-designated Comprehensive Cancer Centers in the U.S. and the only one in North Texas, is among just 30 U.S. cancer research centers to be designated by the NCI as a National Clinical Trials Network Lead Academic Participating Site. UT Southwestern, one of the premier academic medical centers in the nation, integrates pioneering biomedical research with exceptional clinical care and education. The institution's faculty has received six Nobel Prizes, and includes 22 members of the National Academy of Sciences, 16 members of the National Academy of Medicine, and 15 Howard Hughes Medical Institute Investigators. The faculty of more than 2,700 is responsible for groundbreaking medical advances and is committed to translating science-driven research quickly to new clinical treatments. UT Southwestern physicians provide care in about 80 specialties to more than 105,000 hospitalized patients, nearly 370,000 emergency room cases, and oversee approximately 2.4 million outpatient visits a year.